CBD Treatment For Your Dog or Cat? While it is apparent that the use of cannabis can be beneficial for the health of humans, an untapped market in the development of CBD as a product is its efficiency with animals as well. When it comes to cannabis, there is very little research on its impact on dogs and cats. Many pet-owners often treat their animals like family members, and will do all they can to make sure that their pet is as healthy as possible. When a pet gets sick and conventional healing options don’t work, many pet-owners have began to look at alternatives, particularly natural healing. Though there are not many trusted individuals who can provide professional consulting on cannabinoid therapies for pets, it is clear to many in the veterinary field that cannabis can be of great use. The reason that I even began to research more in depth about this topic is because of a conversation I had with my professor. She told our Social Media and Internet Marketing class that her dog often gets anxious and afraid during bad storms. In order to calm the dog down, she utilizes cannabis to assist her animal with sleep. Funny enough, my roommates and I just got a dog of our own, and as hyper as he is, we will most likely use cannabis as a method to calm him down sometimes as well. Though there are similar results in humans and pets alike, Richter notes that the reason for the lack of research is because cannabis is still federally illegal, therefore it cannot be funded. Richter believes that once there is a legal pathway, the research will happen because there is too much money involved. He would like to see more research on the effect of cannabis on gastrointestinal issues, pain, and inflammation for animals. Many veterinary patients have seen “dramatic” effects with cannabis as a use for these specific ailments. When asked about the difference between the endocannabinoid systems in pets versus humans, Richter states that n the big picture they are very similar. Otherwise, Ritchter notes that when cannabis medicine is used efficiently, their endocannabinoid system will act in the same way it would for a human. Cannabis toxicity is nonfatal and does not cause long-term effects for animals, however, Richter has heard of a few cases where pets did not survive after digging into their owners stash. When used responsibly, the goal of medical cannabis for animals is never to get them “stoned”,rather alleviate their pain in the short term. This is surprising due to the fact that California has already legalized medical marijuana, and is very proactive in monetizing cannabis as well. While the research is lacking still in the use for animals, it is clear that in the right dosage, animals can enjoy cannabis as well. Once legalized at the federal level, it should be no surprise that research into medical cannabis use for animals will be researched at much greater lengths. Although both of my former blog posts were centered around the use of marijuana, please do not be confused. Hemp and marijuana are in the same family, but both plants are valuable for different reasons. Both Hemp and marijuana are apart of the cannabis family, but are cultivated and applied completely different to everyday life. Hemp is used in a variety of applications that marijuana could not physically be used for at all. In their physical makeup, hemp and marijuana are completely different. As you can see in the picture below, hemp plants are aligned on the left side and marijuana, its much more popular cousin, is aligned on the right side. 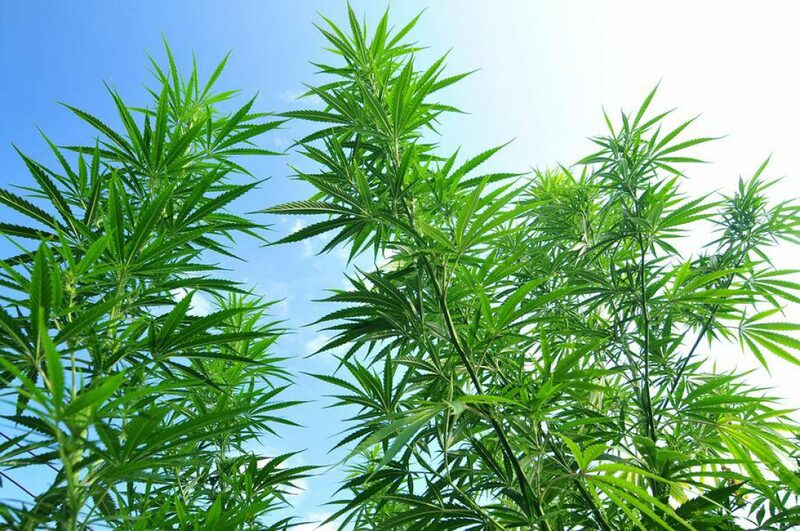 Hemp stalks can grow up to four meters tall organically, and do not need pesticides to grow. Hemp leaves are much thinner and less densely placed than leaves of a marijuana plant. Chemically, hemp and marijuana differ in their capacity for THC. Hemp is categorized by a low THC level, less than 0.3%, while marijuana is categorized by high THC levels, ranging anywhere from between 5% to 35%. Hemp compensates for its lack of THC with a higher amount of CBD, the non-intoxicating compound with more medical applications. Due to its lack of high THC level, hemp is not a psychoactive plant, opposed to marijuana. In terms of cultivation, hemp requires minimal care and can adapt to grow in the majority of climates. On the other hand, marijuana must be grown in carefully controlled atmospheres. Naturally, there are only a few specific climates that have the capacity to produce marijuana. This explains why in the photo the hemp plants are photographed in a natural environment, while marijuana cultivation is taking place in a warehouse. The reason why hemp is so interesting is because it has the potential to be help provide sustainable energy. It has already been used in tests to power automobiles, providing an alternative fuel to harsh fossil fuel emissions. Hemp has also been used in body care, clothing, construction, food production, plastic, and much more. The plant has been grown for centuries and production of it has soared over the past year. According to Jeremy Berke of the Business Insider, the impact of the legalization of cannabis across various states has lead to great industrial excitement. From 2016 to 2017, the number of acres licensed for hemp cultivation increased 140 and the number of producers DOUBLED over the same time. Following projections, the hemp market in the United States alone is prime to hit $1.65 billion in 2021. In March of this year, Senator Mitch McConnell introduced a bill to legalize industrial hemp. I am positive, that in a few years, all cannabis use will be legal due to its economic implications. In America, if it makes money, it makes complete sense. If i had a recommendation, I would suggest you to get in the industry now before it gets dominated by large corporations.